Noemi Grigoletto De Biase1, Bruno Teixeira de Moraes2, Mariana Dantas Aumond Leb3, Gustavo Polacow Korn4, Marina Padovani5, Miriam Moraes6, Glaucya Madazio7. poliomyelitis, post-polio syndrome, neuromuscular diseases, larynx diseases, voice disorders. Introduction: The post-polio syndrome (PPS) is characterized by a new episod of atrophy or muscle weakness in individuals previously affected by poliomyelitis. The symptoms start from an extended period of clinical stability ranging from 20 to 40 years, after the initial chart of polio. Among the pathophysiological mechanisms, the most likely is that the syndrome represents a process of attrition and neuronal metabolic exhaustion due to a continuous process of denervation reinnervation which begins after the initial acute. Objective: Review the clinical characteristics and pathophysiological of PPS,as well as present the approach in cases with pharyngolaryngeal manifestations. Case Report: We present the clinical case of a male patient with 48 years old, with main complaints of dysphonia, dysphagia and previous history of polio. The patient underwent a diagnostic investigation, in which the voice psychoacoustic findings are described. Laringoscopic, electromyographic and the videoendoscopy of swallowing compatible with PPS. The treatment consisted in phonotherapy in a total of 11 weekly sessions and guidelines for swallowing, with satisfactory improvement of the symptoms. Final comments: The pharyngolaryngeal manifestations of PPS are susceptible to treatment, obtaining satisfactory results, with improvement of life quality of the patients. The poliomyelitis, caused by RNA enterovirus (picornavirus), is in most of the cases little symptomatic or manifests itself with a clinical Picture similar to a cold or flu (1,2). The central nervous system involvement with paralysis or paresis occurs in 1 to 2% of the cases (3). The affinity of virus by neurons of the anterior horn of the spinal results in the loss of these cells and consequent Wallerian degeneration of nerve fibers, resulting in muscle weakness (4). After the acute phase of denervation, usually occur reinnervation of some muscle fibers by axonal branches from others motor units not denervated, with recovering of muscle function, in greater or lesser extent (4,5). The bulbar form can follow the involvement of the members or occur in isolation. Although any nucleus can be involved, the most frequent are the ones in the bridge, particularly nucleus ambiguous, nucleus V, VII, XII and vestibular nucleus (1). This form of the disease presents a high rate of mortality because of the vasomotor disorders that can occur as hypertension, hypotension and shock (1). The patients that recover generally are able to develop compensation of oropharyngeal problems, making these manifestations less important than in the acute phase of the disease (6). After a long period of stability, that range from 20 to 40 years, patients with previous history of polio, can develop a late deterioration manifested as mobility impairments, of upper limbs functions, of respiratory capacity and activities of daily life (1). The post polio syndrome (PPS) is about a new history of weakness or muscle atrophy in clinically affected muscles by previous polio or in apparently not affected muscles (1,7). The complaints often reported by patients with PPS include progressive weakness, fatigue, muscle pain, joint pain, and limitation of mobility and psychological stress (4). The involvement in pharyngeal-laryngeal, the complaints are frequent like dysphagia, dysphonia, dyspnoea; and the therapies proposed for these cases range from phonotherapy to tracheostomy. The first described case of PPS is assigned to RAYMOND in 1875 (8). The percentage of individuals that develop the PPS is not precisely known. In a epidemiological study performed at Mayo Clinic, was observed that 25% of the patients that survive poliomyelitis presented late effects of the disease (9). Other studies point to a 90% rate (10,11). Some factors related to a acute condition of polio were associated to the development of late symptoms of PPS: age under 10 years old, need of hospitalization, use of a fan and paralytic involvement of the four members. In this way, the age and gravity of initial picture seems to relate to the development of new symptoms, years later (4, 5, 12). The PPS pathogenesis remains unknown although several mechanisms have already been proposed: natural loss of motoneurons because of age in individuals with reduced numbers of neurons because of the previous poliomyelitis, accelerated loss of motoneurons because of the overload of the surviving cells, incapacity of surviving motoneurons into keep in constant operation, large motor territories after extensive reinnervation, changes in the brainstem producing central fatigue, autoimmunity and chronic infection by the virus (13). The most likely is that the syndrome represents a process of wear and exhaust neuronal. Other hypothesis consider the possibility of a continuous process of denervation-reinnervation which requires as increase of metabolic demand in the branches; with the decrease of these reserves there may be gradual loss of axonal fibers, with consequent muscular atrophy. Few articles mention the dysfunction of the laryngeal muscles at PPS. The dysphagia has been the most common symptom found in these patients (6). ROBINSON et al (10) related three cases of PPS affecting the laryngeal muscles with pictures of a initial manifestation of the disease with bulbar symptoms. The clinical findings of patients with PPS affecting the laryngeal muscles include weakness of adduction or unilateral or bilateral abduction and fatigue associated with a continue use of voice (10). The evolution of the disease in the larynx can occur in slow motion too (10). IVANYI et al (14) showed no significant loss of oropharyngeal function in a period of 1 to 3 years in patients with dysphagia. The criteria for diagnosis include previous history of poliomyelitis, partial or total recovering of the initial function after the primary outbreak of paralysis, clinical stability for at least 10 years and progressive development of muscle weakness (15, 16). Most of the electrophysiological studies shows that patients that become symptomatic years after the polio present signs of severe acute illness in the past, in other words, decreasing of number and reorganization of motor units. These findings are compatible with great loss of cells of the anterior horn of the spinal during the acute outbreak (4). Electromyography in these patients are observed signs of extensive denervation and reinnervation, indicating previous poliomyelitis and action potentials of the large motor units and reduced in numbers, consistent finding with the loss of many motoneurons and increase of the territory of the muscle fibers innervated by neurons remaining (10). Signs of acute denervation and reinnervation can be found both in symptomatic and asymptomatic individuals (4). According to AGRE et al (4), the effects of training programs at long-term syndrome are unknown. Alternated exercises with period of rest seem to decrease the muscle fatigue and increase the capacity of cover the muscle strength after the exercise. HERBISON et al (17) claim that the exercises with brief muscle contractions, isometric or isotonic, are more beneficial to the increase of muscle strength than the usual programs of exhaustive exercise. MLC, 48 years, male, married and a salesman. The patient search for medical care with history of slurring of words during speech, with worsening throughout the day for 9 years. The picture presented sudden onset and progressive character, coming to be unable to speak for periods of 15 days, with spontaneous recovery. Now complaints of tiredness to speak with worsening throughout the day, associated to voice weakness, change of letters and omission of the last syllables of words. Refer improvement of symptoms after sleep a few hours. Refer still tiredness in the lower limbs. Sporadically presents chokes during swallowing solid food. The patient is a smoker of 15 cigarrets per day for 36 years and had child paralysis at age of three years old which coursed into left facial paralysis and lower limb motor deficit. At the time was hospitalized for a two years period, but can't explain the reason for why such a long stay at the hospital. To the physical exam and otorhinolaryngological presented diversion of oral rhymes to the right. Nasofibrolaryngoscopy showed insufficient soft palate, hyper median constriction of vestibular folds that which worsened during the phonation and stasis of secretions in the pyriform sinuses hyaline. Telelaryngoscopy was observed vocal folds with preserved mobility, complete glottal coaptation and absence of lesions. The evaluation of vocal behavior showed rough voice and strained-strangled, in a moderate to intense degree, with laryngeal pharyngeal resonance and sound breaks. The maximum time of phonation was inside the patterns of normality, withe average of 16 seconds. Vocal instability was evident, with decrease of frequency of intensity, vocal attacks alternating between abrupt and isochronous, intense use of reserve air and lack of pneumophonic coordination. Presented a severe pitch, reduced loudness and limited modulation. The speed of speech was adequate, although with articulation indistinguishably. During the period of speech therapy was observed worsening of vocal fatigue and all the items evaluated throughout the session. The vocal pattern to vocal cadence was similar to the sustained emission. Was performed a laryngeal electromyography which showed rarefaction of the trace in the cricothyroid and thyroarytenoid muscles bilaterally, presence of potentials of great amplitude and duration, as synkinesis in the thyroarytenoid left muscles (Image 1). Considering the findings described above, was performed a diagnostic hypothesis of Post Polio Syndrome and indicated Phonotherapy. The speech therapy has presented as a objective the smoothing of the emissionm the increase of pneumophonoarticulatory coordination and the improvement of speech intelligibility. Were performed 11 weekly sessions about 30 minutes each. 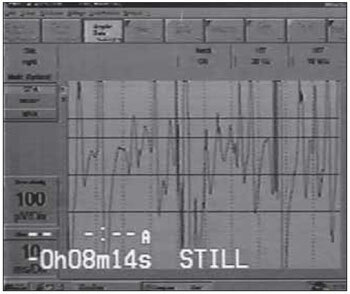 As result of the treatment, the patient showed improvement in speech patterns, but with more significant results during the tasks of sustained emission. The characteristics that identify the evolution of the patient in the speech therapy are: important reduction of tension during phonation with elimination of choking, range of pneumophonoarticulatory coordination by increasing the breaks during the speech, elaborate articulation with bigger amplitude of movements and reduction of speed of speech; such adjustments were capable of reduce the complaints of shortness of breath and vocal tiredness of the patient, and allow a bigger adaptation of vocal quality and intelligibility of speech. The patients was also submitted to the video endoscopy of swallowing exam to evaluation of dyphagia, being observed the closure of the coronal velopharyngeal and incomplete, proper laryngeal elevation, without signs of salivary stasis, laryngeal penetration, tracheal aspiration or residue after swallowing. The pharyngeal and laryngeal sensitivity were preserved. This way, the patient received general orientations to swallow with improvement of gasps complaints. Image 1. Electromyography of the thyroarytenoid left muscle. Many are the causes of motility of vocal folds. The anamnesis the complete otorhinolaryngological exam followed by nasofibrolaryngoscopical exam, strobe video-laryngoscope and laryngeal electromyography, lead to different diagnoses. Particularly, the clinical history of previous poliomyelitis must warn the doctor to the possibility of PPS to cause vocal fatigue. Is estimated that PPS affects 25 to 90% of patients with previous history of poliomyelitis (9,18). The most common symptoms are fatigue and muscle tiredness previously affected or not (1). The PPS generally becomes apparent 30 years after the initial infection by the polio virus. It is more common the appearance during the periods of emotional stress or physical. Also ir more common their occurrence in people affected by poliomyelitis after 10 years old, that used mechanical ventilation and with more extensive disease (11). There are few reports in literature of PPS affecting the laryngeal muscles. ROBINSON et al (10) related three cases of patients with PPS affecting the laryngeal muscles and had presented pictures of initial bulbar manifestation of the disease. Our patient, in particular, does not fit the profile of appearance of the disease, having contracted her with age of three years old. However, the time of initial manifestation of the disease and the late symptom of vocal fatigue was at 36 years and the initial involvement was extensive, affecting both neuronal bodies and spinal, leading to deficit of the motor lower limbs, like bulbar neurons, attending with facial paralysis, coinciding with the findings of ROBINSON (10). The fact of the patient have remained in hospital by a period of two years corroborates with the hypothesis of extensive disease and probably with the involvement of other brain stem cores. His recovery was excellent, because presents only a small deviation from the mouth rhymes and there are no important motor disorders in lower limbs, or noticeable muscle atrophy walks normally. The described patient in the case made Professional use of voice (salesman) and noted worsening of the symptom of vocal fatigue throughout the day. The continuous use of the muscles already compromised takes to the precipitation of the symptoms (1,4). Relationship with the individual background, there was no history of diabetes mellitus, exposure to toxic agents or family history of neuromuscular disease, as there was signs observed in the larynx, but this sign don't often occur, unless there is extensive involvement, as described by AGRE (1). However was observed stasis in the pyriform sinus, signaling to the involvement of pharyngeal muscles or esophagus. The electromyography of the patient larynx showed thinning of the trace and presence of great potentials of great amplitude and length, indicating earlier neuronal commitment, with reinnervation and increase of the territory of remaining motor units. The presence of synkinesis in the thyroarytenoid left muscle is another evidence of the existence of a previous process and its resolution with abductor fibers innervating adductor muscles. In relation to the proposed treatment to our client, there is reason to believe that phonotherapy must be beneficial once the exercises of rehabilitation to the extremities showed that the increase of muscle strength and elevate the maximum extraction of oxygen (19). ABAZA et al (6) reported three cases of patients with laryngeal symptoms of PPS characterized by respiratory difficulty, dysphagia and dysphonia with vocal fatigue, quiver, decrease of loudness and vocal breaks. These patients were treated with success with phonotherapy that aimed to eliminate the hyper function and compensatory muscle tension, increase of the loudness and fatigue, with optimization of residual laryngeal muscle function. In relation to dysphagia, the patient was only assessed effectively after the beginning of phonotherapy through swallowing video endoscopy. Probably phonotherapical techniques and decrease of muscle tension associate to the improvement of coordination pneumophonic and of articulation have reflected into a better coordination to swallow, and for that at the time of evaluation the exam did'nt showed dysphagic changes. In relation to the complaints of sporadic gagging, the patient reported improvement after general improvement to swallowing and phonotherapy. The diagnosis of PPS depends of the high rate of suspicion and a good anamnesis, in which the patient reports previous history of poliomyelitis. As in the most of the cases these patients present other commemorative resulting of the syndrome, voice alterations become less evident before the whole picture. Active searches in services of references in treatment of PPS can show that the frequency of dysphonia and dysphagia maybe is bigger than the ones described in the literature. Considering that the laryngeal-pharyngeal manifestations of PPS are suitable for treatment with improvement of life quality of the patients, is evident the importance of the diagnosis. 1. Kidd D, Williams AJ, Howard RS. Poliomyelitis. Postgrad Med J. 1996, 72:641-7. 2. Blondel B, Duncan G, Courdec T et al. Molecular aspects of poliovirus biology with a special focus on the interactions with nerve cells. J Neurovirol. 1998, 4(1):1-26. 3. Horstmann DM. Epidemiology of poliomyelitis and allied diseases. Yale J Biol Med. 1963, 36:5-26. 4. Agre JC, Rodriguez AA, Tafel JA. Late effects of Polio: critical review of the literature on neuromuscular function. Arch Phys Med Rehabil. 1991, 72:923-31. 5. Klingman J, Chui H, Corgiat M, Perry J. Functional recovery. A major risk factor for the development of postpoliomyelitis muscular atrophy. Arch Neurol. 1988, 45:645-7. 6. Abaza MM, Sataloff RT, Hawkshaw MJ, Mandel S. laryngeal manifestations of Postpoliomyelitis Syndrome. J Voice. 2001, 14(3):291-4. 7. Dalakas MC, Elder G, Hallet M, et al. A long-term follow-up study of patients with post polio neuromuscular symptoms. N Engl Med. 1986, 314:959-63. 8. Raymond M. Paralysie essentialle de l'enfance atrophie musculaire consecutive. Gaz Med Paris. 1875, 226. 9. Codd MB, Mulder DW, Kurland LT, Beard CM, O'Fallon WM. Poliomyelitis in Rochester, MN 1935-1955: epidemiology and long-term sequelae, a preliminary report. In: Halsted LS, Wiechers DO (eds). Late effects of poliomyelitis. Miami: Symposia Foundation; 1985. pp. 121-134. 10. Robinson LR, Allen DH, Waugh PF. New laryngeal Muscle Weakness in Post-Polio Syndrome. Laryngoscope. 1998, 108:732-4. 11. Halstead LS, Rossi CD. New problems in old polio patients: results of a survey of 539 polio survivors. Orthopedics. 1985, 8:845-50. 12. Ravits J, Hallett M, Baker M, Nilsson J, Dalakas MC. Clinical and eletromyographic studies of post polio progressive muscular atrophy. Muscle Nerve. 1990, 13:667-74. 13. Jubelt B, Cashman NR. Neurological manifestations of the post-polio syndrome. Crit Rev Clin Neurobiol. 1987, 3:199-220. 14. Ivanyi B, Phoa SS, de Visser M. Dysphagia in postpolio patients: a videoflurographic follow-up study. Dysphagia. 1994, 9:96-8. 15. Klingman J, Chui H, Corgiat M, Perry J. Functional recovery. A major risk factor for the development of postpoliomyelitis muscular atrophy. Arch Neurol. 1988, 45:645-7. 16. Agre JC, Rodriguez AA, Sperling KB. Symptoms and clinical impressions of patients seen in a postpolio clinic. Arch Phys Med Rehabil. 1989, 70:367-70. 17. Herbison GJ, Jaweed MM, Ditunno JF Jr. Exercise therapies in peripheral neuropathies. Arch Phys Med Rehabil. 1983, 64:201-5. 18. Cashman NR, Maselli R, Wollman RL, et al. Late denervation in patients with antecedent paralytic poliomyelitis. N Engl J Med. 1987, 317:7-12. 19. Birk TJ. Poliomyelitis and the post-polio syndrome: exercise capacities and adaptation - current research, future directions and widespread applicability. Med Sci Sports Exerc. 1993, 25(4):466-72. 1) Prof. Doc. Associate of Departament of Fundamentals of Phonoaudiology of Pontifical Catholic University of São Paulo. Advisor of Masters Degree of UNIFESP-EPM. 2) Fellow in Larynx and Voice by the Departament of Otorhinolaryngology and Surgery of Head and Kneck by Federal University of São Paulo - Medical School Paulista (UNIFESP-EPM). Doctor Otorhinolaryngologist. 3) Master in Medicine by UNIFESP-EPM. Doctor Otorhinolaryngologist. 4) PhD in Science by the Departamento f Otorhinolaryngology and Surgery of Head and Kneck by Federal University of São Paulo - Medical School Paulista (UNIFESP-EPM). Doctor Otorhinolaryngologist. 5) PhD in Science of Human Communication by UNIFESP. Clinical Audiologist. 6) Master in Science of Human Communication by UNIFESP - Clinical Audiologist. 7) PhD in Science of Human Communication by UNIFESP. Clinical Audiologist. Article received in November 3rd of 2009. Article approved in April 4th of 2010.